The Workshop helps you turn your video into an online presentation that users will love to watch and use. It makes your videos easy–to–search, accessible to all, search engine–optimized and mobile ready. With the Workshop, it's easy to add rich metadata, synchronized slideshows, links, files, speaker IDs, chapters and other related content. The Workshop is a comprehensive platform. Group your video presentations by project. Collaborate with colleagues. Manage everything from uploads and publishing to the reports that detail your success. To get started you’ll need to upload your videos into the Workshop. Our uploader makes that step secure, reliable, fast and easy. Upload a batch of clips and monitor the progress. Pause and resume uploads. Uploads are securely transmitted over https. Each piece of your upload is verified, so when it’s done, you know it’s ready. We take in video in 12 different formats – mp4, flv, wmv, mov and more. Each upload is given a generous 5GB limit. Uploads interrupted by a dropped connection or an accidental close of the page, will automatically resume where you left off when you try again – even across different computers or browser sessions. The Workshop makes it easy to work with your entire video library and collaborate with others on it. Organize your video presentations by project. In each project, you can establish publishing rules, control access, create categories and customize the style of templates. Give users access to one or more projects, or make them an administrator to share all projects. Create categories to organize your content. Sort and search through all your assets. The Workshop saves your work in the background to make sure nothing is lost and keeps you on task. No Save button to slow you down. Videos are automatically grouped together, when you encode in the Workshop, to keep your library clean and organized. You can do the same for videos you upload, and specify which video is the source file, in case you need to encode from it down the road. Watch previews of your video clips. View detailed stats about them – dimensions, frame rates, codecs, bitrates, and more – if you’re into that kind of thing. The Workshop serves as a video synchronization platform, making it easy to add synchronized slideshows, caption your video, time your metadata and more. Play your video alongside the elements you need to sync up. Click ‘Set Time’ and move on to the next one. We’re positive you’ll find this the easiest and fastest way to sync up your slideshow, create chapters for your video, and handle any other timing task. Timing buttons shift the video back or forward by a few seconds, in case you missed your sync moment – no fumbling on a scrub bar. Since our sync screens are fully keyboard navigable, you never even have to reach for your mouse. 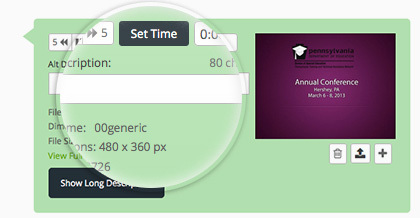 Timecodes are editable, giving you precision down to 1/100th of a second, if you need it. As you sync elements in the Workshop, they switch from silver to green. A quick scan, and you know which elements remain to be timed. Preview your presentation any time to make sure you’re on track. It is truly easy to caption your video in the Workshop. Start with a transcript and upload it. Workshop parses and splits it up into segments ready for you to sync. 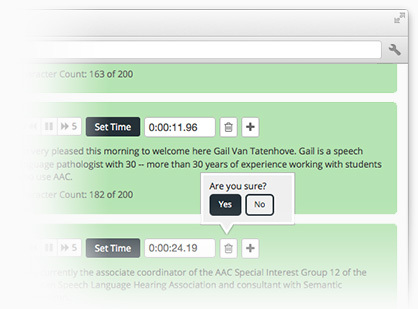 You can edit on the fly – click a segment to make corrections, remove segments or insert new ones. Should I Caption My Video? Captioning ensures access for users who are deaf or hard of hearing, and provides great rewards in terms of search, SEO, usability, and better retention and comprehension of information for many audiences. We can’t think of any reason not to caption video. If you have a caption file, Workshop will import all the caption segments and timings. Feel free to edit timings, make text corrections, and then export it. If you’ve ever had the misfortune of manually editing a caption file – you will love Workshop for this feature alone! Easily setup chapters for your video. Provide context for users by displaying thumbnails from the video representing each chapter, or use a custom image instead. Import your slides and the Workshop slices them up, extracts all the text and descriptions and places them on a sync screen ready for you to sync and make edits. The Workshop provides the easiest and fastest way to sync up a slideshow with your video. Time your slides or graphics, with precision, in a fraction of the time it takes to watch your video. To make your slides searchable and accessible, the Workshop extracts all the text and descriptions in your slideshow. Assign an alternate description for a slide, as well as a long description, all editable on the sync screen. 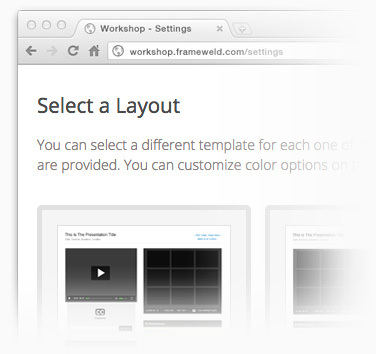 The Workshop provides four default templates for you to use – designed to provide your end users with a friendly experience. The layouts are clean, spacious, well labeled, and styled in black, white and shades of grey. This neutral theme works with almost any website without adjustment. Our templates are pretty smart. Let’s say you pick a template but don’t include speaker information or chapters. The template adjusts and hides those areas until you add content. No awkward blank areas with missing content. Our smart templates are great for getting content out to your users as fast as possible. You can make your video available immediately, and add layers of content – chapters, captions, slideshows, as you have them ready. No need to wait for everything to be ready before giving your audience something to work with. If grey is not for you, the Workshop lets you pick from 5 different color schemes that work beautifully together. Adjust font styles too, to perfectly mesh our templates with your own site’s styles. Set custom colors for 14 different elements – from the page background and caption text to the heading backgrounds and search highlighting. 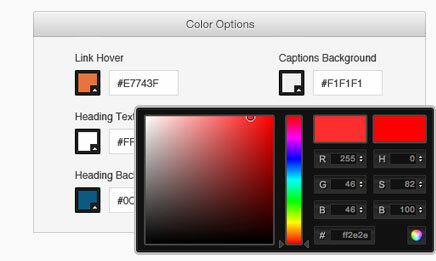 Icons sets can be set to light or dark, to ensure your color palette works all around. The Workshop works beautifully with custom templates. Just contact us and we can setup templates that perfectly mesh with your own website’s styles, colors, and textures. You can pick the elements you want to use in your custom template and we can size, position and style them to achieve the exact effect you’re aiming for. The possibilities are limitless – send us your design file or ask us to design it for you. Copy, paste is all the tech effort you need to get video presentations integrated into your website. 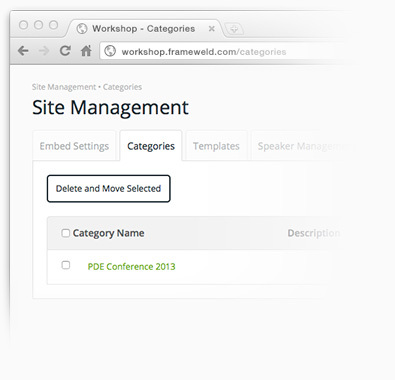 Do the same to embed a list view of all your presentations on your site. Exercise your copy, paste fingerwork a third time to integrate a comprehensive search results page. Our embed code works smartly together to save you from carpal tunnel syndrome. 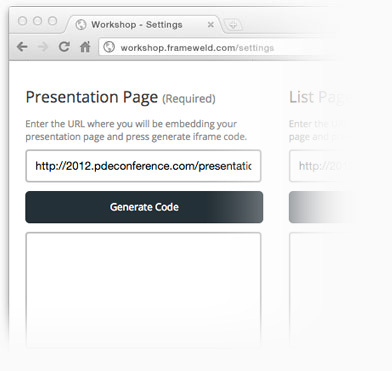 Paste in the code for one list view and one presentation page and you can deliver 5, 50 or 500 presentations. Will You Make Me Paste Again? Nope. By pasting a list view, presentation page and search page that work together, there is almost never a need to update the code on your site again. Every update you make in Workshop shows up on your site, whether it is new content, changes to categories and sort order, styling changes and anything else. The moment you make a change in the Workshop it is available to your users. No publishing routines. No delay. To keep content available exclusively on your site, simply bind a project to your domain. You can customize the domains for each project, giving you maximum flexibility. 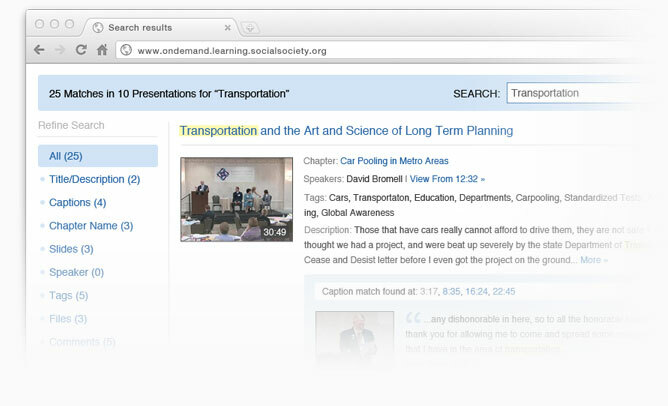 Describe your video presentations with dates, descriptions, locations, tags, speakers, categories and more. All of your meta efforts are paid back in improved search capabilities, greater accessibility, and enhanced SEO karma. Our efficient sync screens allow you to time metadata related to your video. Let’s say you identify two speakers featured in your video. 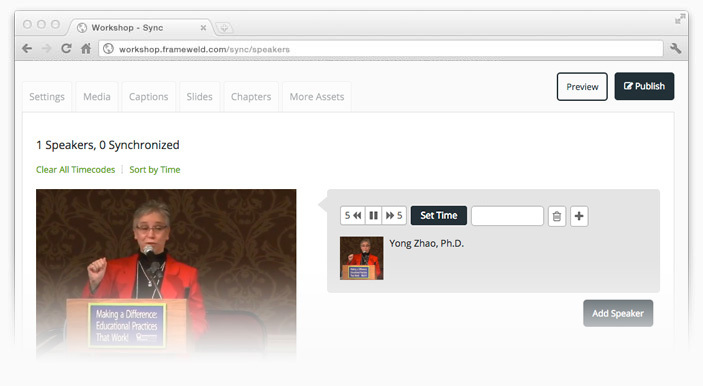 Go a step further and let users know what time they appear in the video, so you can easily link to a speaker’s remarks. Our approach to accessibility is informed by Universal Design. Behinds the scenes in the Workshop is plenty of code that enables accessibility of information for various audiences – captions for the deaf and hard of hearing; keyboard navigation for physically and visually impaired users; video control shortcuts and descriptions of visuals for visually impaired users; and beyond. We approach these accessibility features the same way we handle our visual interfaces – with careful planning and attention, to ensure that accessing our presentations is easy and friendly for all users. We make the content, which makes our presentations accessible, available to all. Every user benefits when we put that data to work, to power great capabilities like video search. The Workshop has robust support for Unicode which means that you can create your video presentations and work in any language. Different scripts and right-to-left writing systems are never a problem. When it comes to accessibility, you know you’re in good hands. Frameweld, the creator of the Workshop, has 11 years of experience making online video, rich media and web applications accessible. Our accessibility work has benefited clients in federal and state government, Fortune 100 companies, school districts, universities, non-profit organizations, foundations and others. Full text search through all content related to your video – titles, descriptions, captions, slide data, chapter labels, speaker information, and more. Our friendly search results interface, structures results by video and by type, making it easy to spot matches and filter results. Video and slide thumbnails provide visual context for matches. When users find what they’re looking for, our results link them directly to the video and precise time of the match. If search doesn’t perform well, people won’t bother to use it. Our search provides lightning fast results, leaving users wanting more. Look at your usage stats for all your videos or zoom in to get details on one specific video. Views, location, duration, mobile, bandwidth, average % viewed… are just some of the details you can access. Check out the default 30 day view, or customize the date range to pull out the exact timeframe you want to measure. One glance tells you where you stand in terms of usage. Optional email notifications can ping you when you’re close to your plan’s limits. Our video heat maps will answer that question and give you insight into the portions of your video which are hottest, and where users drop off. Google Analytics is integrated into every iframe you embed – videos, presentations, list views, etc. Plug in your Google ID (or several) and get access to all the stats on the page level usage of your Workshop content. A rock solid platform for speeding through video work and delivering reliably around the corner and around the world. The Workshop is integrated with the Limelight CDN. Limelight is a dream network, second to none, with a private global fiber backbone, connected to 850 last-mile networks. We could go on and on, but trust us – it doesn’t get better than this. To ensure a great experience, users get your video from the delivery center closest to them. 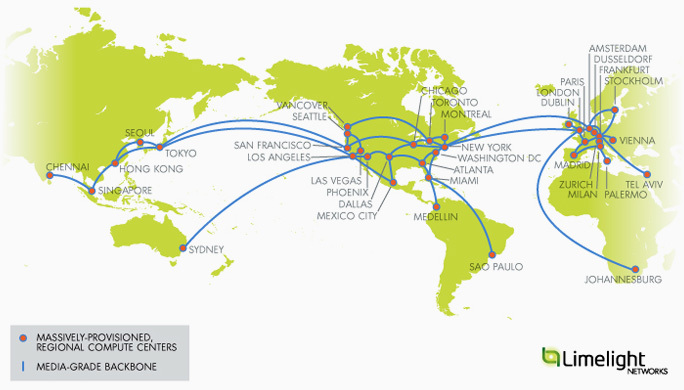 15 delivery centers in North America and 22 others around the world, means your video is never far from your users. This architecture intelligently routes around network traffic and trouble spots. True streaming allows your users to start watching your video in an instant – no progressive downloads. Users can jump around and seek to search results, the video remains fast and responsive. Bandwidth detection ensures users get the right video for their connection, and monitoring upgrades or downgrades them if needed. Our video processing happens in the cloud – from video encoding to image and metadata extraction. It scales up and down to meet the demands of Workshop customers. Our presentation pages showcasing your video typically load in a fraction of a second. Our cluster handles page delivery, and expands into the cloud if needed. It handled 14 million requests in a one hour period in 2011. You’re in good hands. Our iframes publish into pages delivered via secure HTTPS or standard HTTP. No need to configure anything. No options or hoops to jump through. Just copy-paste and our smart iframes take care of everything, and keep your secure pages… secure! To keep content available exclusively on your site, simply bind a project to your domain. Anyone trying to paste iframes outside your domain will strike out. You can customize the domain for each project, giving you maximum flexibility. Using the RTMPE protocol, the streaming server encrypts your streams “on the fly”. 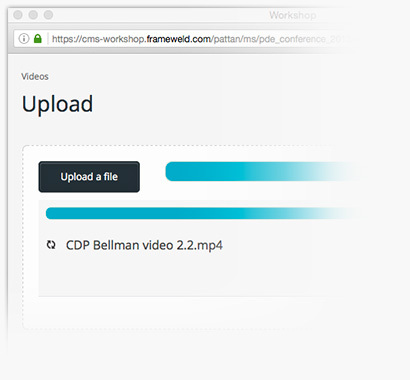 In fact, Workshop streams you media this way by default – keeping your video secure as it travels to the end user. Our Publishing API works with secure keys. You and only you will be able to publish videos and presentations from your Workshop account. With the Workshop, your videos can reach users anywhere on a wide range of mobile devices. Smart encoding and device detection allow you to reach users on almost all iPads, iPhones, Android phones and tablets, and Blackberry smartphones. Deliver your video presentations to users on iPads and other tablets. They look great and have the full range of features available – synchronized slideshows, search, captions and more. Our Publishing API lets you skip the iframes to write your videos and presentations directly into your pages. Mash things up by incorporating your own widgets and content, in and around your Workshop content. The API lets you slice and dice the files and data you put into the Workshop. Our API is also the simplest way to cross-publish your videos to YouTube, iTunes and other applications, while giving you total control over the content and timing of your publishing. Working with our API requires a secure key to ensure that you – and only you – can access and publish to and from the Workshop. Access your key in your admin account. Generate a new key anytime. Of all the features in Workshop, video search is perhaps the one we get the most raves about. Many customers have asked – and now we are delivering an API for our search results! You can incorporate our video search results into the main search function on your site. 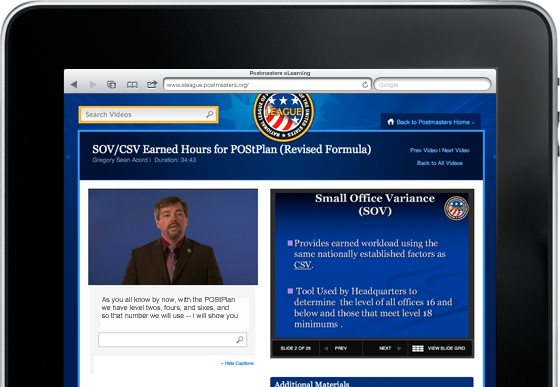 The API even includes access to video thumbnails and timings of results. The interfaces in Workshop allow you to export your videos, slides, transcripts, captions and other timings with friendly export links. Our API makes exports much more powerful – every last bit of data in your Workshop account is available at any time. Pull your data all at once or setup regular exports to integrate your videos, captions and other data into other systems.